We are all familiar with Marcus Aurelius’ Meditations, one of the most famous books of practical philosophy of all ages. But did you know that we also have three speeches attributed to Marcus? 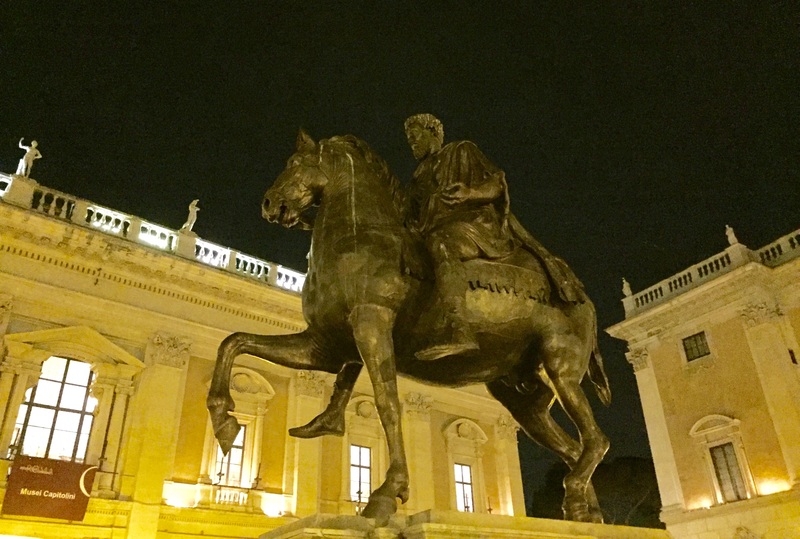 They are collected in Delphi’s Complete Works of Marcus Aurelius, and it’s worth to take a look even though they only indirectly speak to Stoic philosophy. There are three such speeches: one to the Roman Army at the news of the revolt of Cassius in 175 CE; a speech sent by Marcus to the Senate after that same revolt; and his last words before dying. The Delphi translation is by C.R. Haines, and is accompanied by a useful short historical introduction. There is, of course, some doubt on the authenticity of the documents. The speech to the Army is reported by Dio Cassius, who was 20 years old when it was delivered and lived in Rome. He later achieved high office and had lots of sources at his disposal, so there is a good chance that the speech is, in fact, by Marcus, although Dio may have added some stylistic touches of his own, as well as cut the original a bit (it is considered too short for such an occasion). The last remarks of Marcus are given by Herodian, who again was a contemporary authority. Here too, it is possible that Herodian added something of his own, although the speech is short — as would be expected given the occasion — and seems to be in character with what we know of Marcus. The speech to the Senate is reported by Gallicanus, and is less likely to be authentic. Moreover, we know that the original source, Marius Maximus, is not trustworthy, so the whole thing needs to be taken with a large grain of salt. What strikes me about the above passages is Marcus’ attempt to maintain equanimity in the face of betrayal by one of his close associates. He plainly regrets having to take up arms against Cassius, and he would have preferred to be able to show mercy and forgiveness instead. He hopes that there is still a sense of virtue and honor left in the world, and that he can show how to deal virtuously even with a potential civil war. Cassius’ revolt, at any rate, failed to gain momentum, and it isn’t clear even whether there ever was an actual clash between the two armies. Again, it is not known whether these were in fact Marcus words, but we know that the substance of the speech is correct, as the emperor did ask the Senate to grant pardons and he himself did not pursue the typical course of revenge against the conspirator’s associates. This approach is, moreover, in character with what we know of Marcus’ approach to the principate, as well as, of course, his Stoic philosophy. It is hard not to read much of the above in light of Commodus’ (Marcus’ son) disastrous reign. Contrary to his father’s hopes, he did rule by instilling fear into his subjects and by engaging in cruel behavior. Commodus was only 19 when Marcus died, and he actually had been co-emperor already for three years, for the simple reason that he was the only one of Marcus’ sons to survive to adulthood, as well as the first individual to be “born in the purple” since the time of Titus a hundred years earlier. Commodus’ reign ended the golden period of the so-called “five good emperors” (Nerva, Trajan, Hadrian, Antoninus Pius, and Marcus Aurelius), arguably the apex of the Roman Empire. Moreover, his violent death in the 12th year of his principate, as a result of a plot organized by Pertinax, led to a period of chaos known as the year of the five emperors. The chaos ended with the rise to power of Septimius Severus, who was Princep from 193 to 211 CE. This entry was posted in Marcus on March 21, 2017 by Massimo. Did you know that there are also some court judgments of Marcus in existence? My authority for this comes from a conversation with Christopher Gill (Emeritus Professor of Ancient Thought – Exeter University) at the 2015 London Stoicon. I was particularly interested because my profession is that of Barrister. He told me that as far as he knew, they existed only in Latin (mine is schoolboy only) or German (mine is non existent). Christopher also told me that although they do not obviously address Stoic issues there is nothing shocking about them and they are what one would expect from a man such as Marcus. So, I have not been able to read them. Is there any enterprising Classicist out there who is looking for a translation task to undertake? Do you know one, Massimo? I’m sure Christopher (always delightful) would be very helpful as to where to locate these texts. Interesting, though my Latin is also only passable and my German non-existent. I’ll talk to Chris about it. There are also several letters by Marcus to his former mentor, Fronto, they are mentioned in the otherwise awful biography by McLynn.